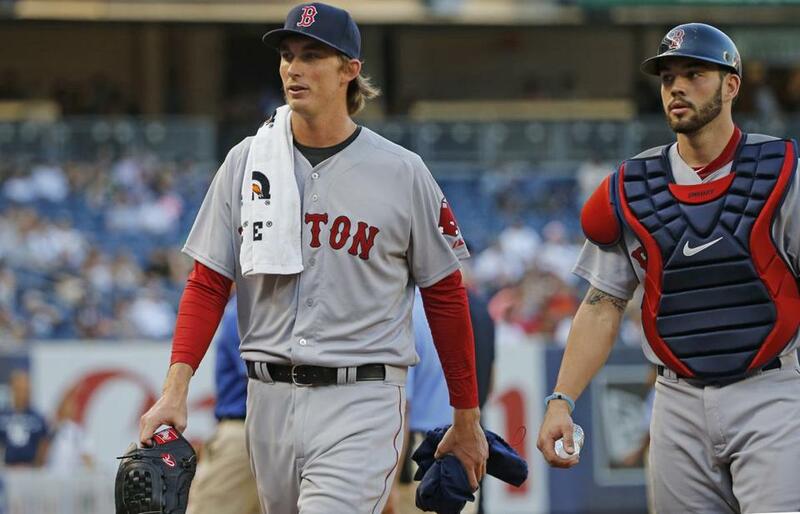 The Red Sox have to figure out if players such as Henry Owens and Blake Swihart are the next big things in Boston, or if they should be used as currency to bring established talent. The Red Sox have a farm system that is considered one of the best in baseball, perhaps the best. It certainly hasn’t in 2015. Despite a highly regarded pool of talent below the surface, the Red Sox have been a mess. That’s tempered the enthusiasm about what lies on the horizon, both inside and outside the organization. The Sox confront a situation in which they are enduring futility in the big leagues but have a farm system viewed by some — including minor league guru Keith Law of ESPN — as the best of all 30 teams. And so, it’s worth asking: How often does top farm system status translate to success in the big leagues? Should the Red Sox hold on to their prospects? The Red Sox have two months to evaluate a host of young players like Henry Owens to determine what kind of assets they represent. Remarkably, none of the last 14 organizations to be designated with the top farm system by Baseball America has won a World Series since receiving that accolade. The last team to hoist a championship trophy following a top farm system ranking was the 2005 White Sox, four years after they’d been named the top farm system in 2001. Only their No. 10 prospect from that group, Aaron Rowand, emerged as a centerpiece of the title team. Still, digging a bit deeper, there’s evidence that top-ranked farm systems have served as the foundation for playoff appearances, and often a sustainable postseason presence. Within five years of being recognized, the teams designated the top farm systems in baseball over the 10-year span from 2005-14 have comprised five of the last 20 World Series participants. The 2008 Rays, 2010 Rangers, 2011 Rangers, 2013 Cardinals, and 2014 Royals all reached the brink of a title soon after being named top farm system. In fact, for those 10 teams, the majority of seasons (22 of 40, or 55 percent) within a five-year window have resulted in playoff berths, all 10 franchises making the playoffs at least once. That history suggests better days may be on deck for Boston. Still, a farm system’s status is far from a guarantee of future success, just as a lowly regarded farm system isn’t necessarily an impediment to success. The Giants have regularly fared poorly in farm system rankings. They’ve shown little distress while enjoying the glimmer of the three World Series rings that burden the hands of many members of their organization. Players like Brandon Crawford, Brandon Belt, and even Buster Posey are part of a group whose big league performance blew past their prospect ranking. The eventual success of teams with highly regarded farm systems hasn’t necessarily come as a result of seeing a wave of players graduating to the big leagues. Instead, there’s a strong case to be made that the value of a highly regarded farm system is the opportunity it presents through trades. One former executive of a team that Baseball America graded as having the top farm system recalled the industry view of his team’s minor leaguers. “We didn’t have our own system ranked No. 1,” he mused. As such, his team felt its best means of capturing value was to trade from its pool of assets. That has been a viable formula for other teams as well. In 2011, for instance, the Royals were named Baseball America’s top farm system after having an unprecedented nine players in the top 100 prospects. The development was so unusual that the publication produced a pair of accompanying stories: One looking at how the Royals produced the best prospect pool in the magazine’s history, another on how they might translate that to success at the only level that matters. First baseman Eric Hosmer (the Royals’ top-ranked prospect that year) and third baseman Mike Moustakas (No. 3) have emerged as solid regulars for Kansas City. But the team also packaged Wil Myers (No. 2), Mike Montgomery (No. 5), and Jake Odorizzi (outside the top 10) to the Rays for James Shields and Wade Davis. Meanwhile, a case can be made that more important homegrown contributors — catcher Salvador Perez (No. 17), reliever Kelvin Herrera (No. 30), and closer Greg Holland (unranked) — came from outside the top 10. Other core members such as Lorenzo Cain and Alcides Escobar came from outside the organization by trading big league assets (Zack Greinke). Does that mean that prospect rankings are meaningless? Are they a reflection of a team’s distorted self-perception or a product of a team’s misguided sense of self? To Manuel, the answer is clearly no. Rankings are based on the feedback of scouts and executives around the industry, reflecting the views of 30 organizations rather than one. That lack of translation offers a potentially fascinating wrinkle. In some respects, a top ranking may be less revealing about the eventual big league performance of prospects than it is a glimpse into their value as a form of currency for addressing big league needs. The Red Sox need not apologize for having a highly regarded farm system, with players such as Henry Owens, Brian Johnson, and Blake Swihart trying to establish themselves at the big league level with Yoan Moncada, Rafael Devers, Manuel Margot, Javier Guerra, and others on the more distant horizon. But the team does need to figure out how to maximize the impact of that group — looking beyond the rankings to separate the future building blocks from the players whose primary value will come as trade chips. “Historically, [top farm system status] has translated over time,” said Cherington. “It doesn’t always in a given year. Obviously, it hasn’t for us this year. There are teams that have had periods of success at the big league level without having a very strong farm system, or at least the perception is that they don’t have one, and then there’s plenty of examples of teams that have. The Red Sox’ future may hang in the balance with how the team answers that question.